Above: Homalco Councillor Kelsie Robinson speaks at the 2018 Vancouver Island Economic Summit on Oct. 25. Representatives from Homalco and Snuneymuxw spoke about their nations’ successes in the tourism industry during a panel discussion at the 2018 Vancouver Island Economic Summit. 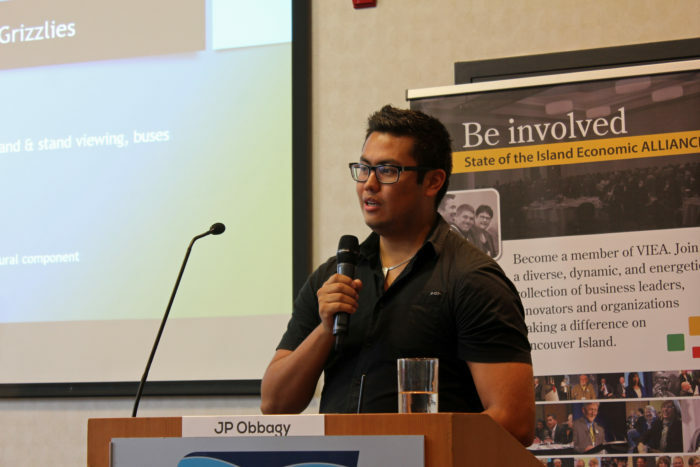 The panel on Oct. 25 was meant to highlight the cultural and economic benefits of Indigenous tourism on the Island. The event was part of the larger and more general two-day summit event. Erralyn Thomas, a councillor with Snuneymuxw, opened the discussion by speaking about her nation’s tourism plan for Saysutshun (Newcastle Island). Chief and council approved a business plan for Saysutshun about a year ago in partnership with the City of Nanaimo and Province of B.C. “That plan identifies proposed and planned facilities that expand our current ones,” she said. Thomas said the plan for Saysutshun includes an amphitheatre, an artisan village, a longhouse, an adventure centre and a restaurant. Snuneymuxw already owns the ferry service from Nanaimo to Saysutshun and hosts interpretive walking tours on the island. “We’re focusing on these tourism initiatives,” she said. Homalco Councillor Kelsie Robinson also spoke during the panel, highlighting his community’s cultural successes with its bear and culture tours. Robinson, who has worked as a guide for the Bears of Bute tours, talked about how there were Indigenous guides on the tours for years but no in-depth cultural component until recently. “We were hit pretty hard with residential schools and we lost a lot of our songs, a lot of our language. There was no singing and drumming in Homalco for decades,” he said. Homalco Wildlife Tours now incorporates legends, language and songs, and most of the guides are youth from the community. “It’s very empowering when you learn your culture,” he said. Lillian Hunt, an independent tour guide in Alert Bay, and Trevor Cootes, a councillor from Huu-ay-aht First Nation, also participated in the panel. JP Obaggy of Homalco Wildlife Tours moderated the event, and spoke about how he is excited to be working with Homalco after more than 25 years working in the tourism industry. “This is a very exciting topic for me,” he said.